An absolute must for every sheet metal shop, large or small. 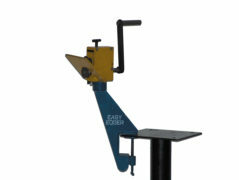 This compact unit will turn a perfect 6mm uniform edge on an inside or outside radius or can be used on straight work. It can be operated either left handed or right handed, has a capacity 1.2mm or lighter. Both forming rolls are properly case hardened to insure maximum lifetime efficiency. The machine body is precision welded steel throughout. A predetermined height groove is formed into the bottom roll and guides the material through the rollers to insure the perfect uniform edge. Easy grip handle is provided for speedy adjustment between the various gauge materials. It comes completely equipped with a solid steel stand which can be clamped to any bench available in the shop, or can be taken out to the job.